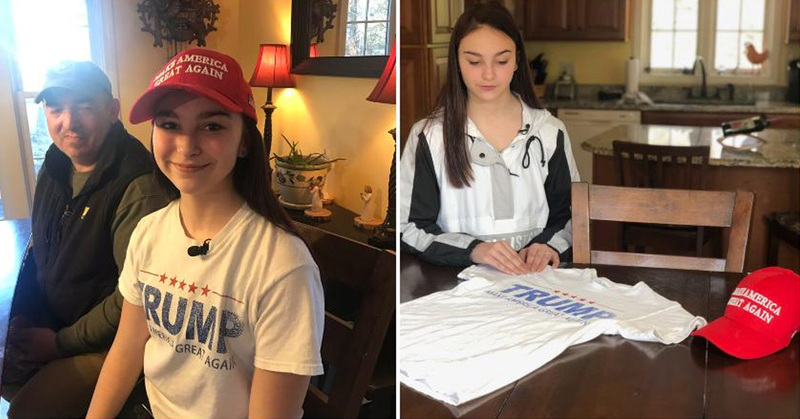 A teen girl is upset after she was asked to cover up pro-Trump clothing at an American Pride event that took place at her high school. This is a slogan that Donald Trump used during his 2016 presidential run. However, she was told several times that the clothing violated the school’s policy. She did not think that the phrase would offend so many people. She also did not understand how the phrase could be construed as something disrespectful. Ciretta took off the hat that said “Make America Great.” She also wore a sweatshirt to cover up her shirt. Ciretta believes that her First Amendment rights have been violated. She said that she can understand why the school would have a problem with the gear if they told the students that they could not wear anything political. However, students were not told that. Ciretta also stated that she has been mistreated by her classmates because of her political gear. She has been made to feel like she is uneducated and a bad kid because she supports Trump. Ciretta’s dad believes that it is important to discuss politics in school. He plans to meet with the school next week and discuss the incident. Epping High School has released a statement about the incident. They stated that two students were asked to remove clothing on American Pride Day. They also stated that they will be investigating the incidents. Ciretta said that she feels like she should be able to have her own opinion. She also believes that other people should be able to have their own opinion. It is fine if two people do not agree.